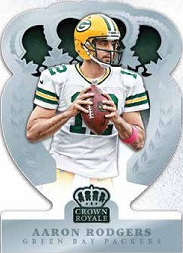 2014 Panini Crown Royale Football brings elegance to its designs. Even since its debut as a Pacific brand in the 1990s, die-cuts have been the focus. That's no different here. Every pack promises either an autograph or memorabilia card. Boxes come with four packs. Over the past few years, Silhouettes have become a key component for the brand. The number of offerings are expanding. Rookie Silhouettes Autographs feature 40 first-year players. All come with on-card signatures that are paired with decent-sized memorabilia swatches that are displayed in die-cut windows. In addition to base versions, parallels include Gold (#/49 or less), Purple (#/25 or less), Green (#/5) and Blue (1/1). 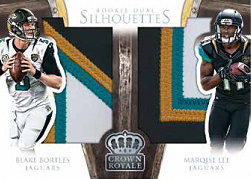 New for 2014 Panini Crown Royale Football are Jumbo Silhouettes. These aren't signed, but as the name suggests, they come with huge pieces of memorabilia. The die-cut window is maintained as well. 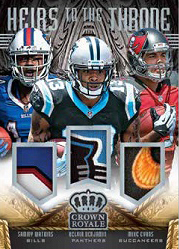 Also new are Dual Rookie Silhouettes. These have a similar look to them but pair up swatches from a pair of first-year standouts. Heirs to the Throne takes on the regal theme with swatches from up to three different players. Rookie Signatures deliver more autographs from this year's crop of freshmen. These come with several foil parallels. As always, base cards are also die-cut. However, this year the design focuses the cut on more than just the trademark crown giving the cards more of a trophy or shield look. BRIAN ORAKPO 2014 CROWN ROYALE "ALL PRO MATERIAL" JERSEY PATCH RELIC 499!!!!!! 2014 Crown Royale Kevin Norwood PURPLE RC AUTO SSP 02 10 ALABAMA AUTOGRAPH WOW! Not all cards are featured in each parallel. Refer to the Excel checklist for exact print runs and specific cards for each parallel. View the Excel checklist here for exact print runs. Hey, everyone. You may want to scope this box out. Target is selling it for $40 (and not the listed $75 for the hobby box above), which seems a bit steep for 20 cards. (Please note: the packs are labeled “Retail’, so maybe the distribution differs.) However, the quality of hits, the fanciness of the inserts, and the die-cut base cards (and rookies too!) more than supersede the potential drawbacks. 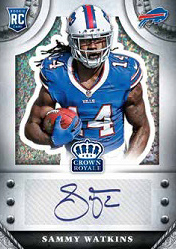 This is a step above the R&S Longevity sets that Panini offered at Target a month or two ago, in value and hits. 4 relics: Heirs To The Throne Triple Relic Matthews/Evans/Robinson (#/399), Terrance West Rookie Silhouettes (#/199), Cody Latimer Rookie Silhouettes (#/199), Blake Bortles Quad Color Rookie Silhouettes (#/25!). I’m new to the sport of card collecting, but historically have not been a fan of what Panini has offered. Until now. Auto stickering aside, this card is very elegant, and a nice change of pace from the Chrome I’ve broken so far this week. Wait til you guys see the die cuts here!!! Nice stuff! I agree, they are some sweeet looking cards! I pulled an Odell Beckham Jr. Laundry Tag NFL Player’s, 1/1!!! A Derek Carr, Jumbo Patch, numbered to 49, YES!!!! Retail is the way to go on this. A high end product that has the potential to hit big at half the price of hobby. Yes you get less hits but the retail exclusive parallels are great. That said some of the players that have autos in this product aren’t great.